The Awards, presented by Dental Health Services Victoria (DHSV), recognise public oral health professionals, volunteers and organisations that go above and beyond to improve the health outcomes of those most in need of dental treatment. 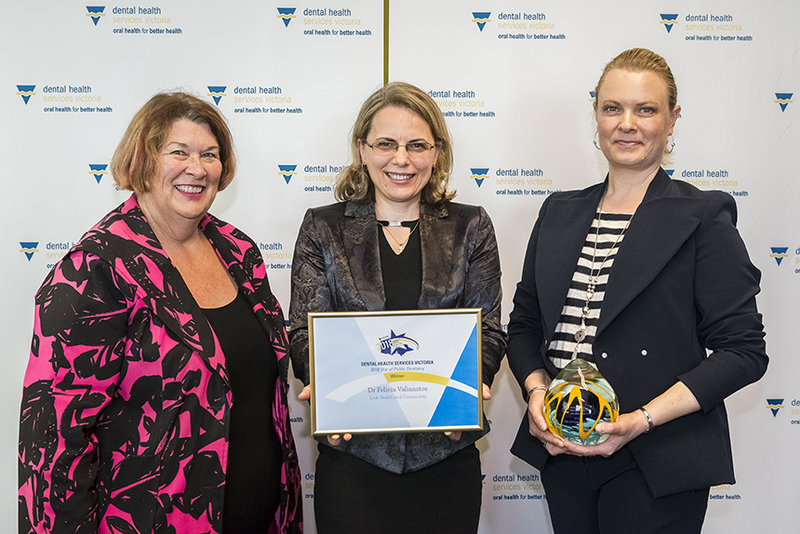 DHSV CEO Dr Deborah Cole said the Award nominations across all four categories highlighted the abundance of outstanding projects, clinics and staff in the Victorian public dental sector. “Our nominees were of an exceptional calibre and I am honoured to be working alongside inspiring people who are doing great things for public health in Victoria,” said Dr Cole. “It wasn’t easy for the judges to come to a final decision, as the public dental sector is staffed with dedicated professionals who want to take oral health promotion and care to the next level. It is great to see other members of the community, not necessarily clinicians, doing outstanding work to promote the importance of oral health too,” she said. The Star of Public Dentistry winner, Dr Felicia Valianatos, applauded the talents of staff within the public oral health sector. “We are in a galaxy of stars and are all stars in our own way. Thank you for recognising my contribution,” Dr Valianatos said. The event also saw DHSV launch the 2018 Oral Health for Better Health magazine, with the announcement that AFL Women’s League player, Brittany Bonnici, is the 2019 Smile of the Year ambassador. For more information about specific categories and photos please contact Manager, Brand and Communications Richard Startari at Richard.startari@dhsv.org.au or 9341 1361.